Dogs Bite Decatur Al: WATERLOO IA - A PIT BULL BEING WALKED ON A LEASH LUNGED AND BIT DOWN ON THE HEAD OF A CAVALIER KING CHARLES SPANIEL NOISILY WALKING OUT A DOOR NEAR IT AND INSTANTLY KILLED HER - IT'S AN ACCIDENT!!! THE PIT WAS TRIGGERED BY THE NOISE OF THE DOOR AND THE LITTLE DOG BARKING AND ALL !!! THE ADOPTED PIT FROM THE POUND WILL LICK YOU TO DEATH...SHE'S A GOOD PIT! 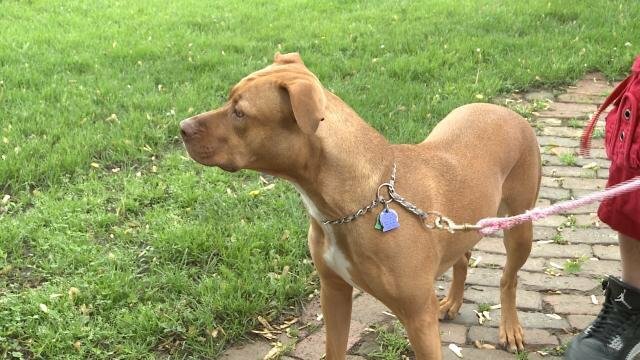 WATERLOO IA - A PIT BULL BEING WALKED ON A LEASH LUNGED AND BIT DOWN ON THE HEAD OF A CAVALIER KING CHARLES SPANIEL NOISILY WALKING OUT A DOOR NEAR IT AND INSTANTLY KILLED HER - IT'S AN ACCIDENT!!! THE PIT WAS TRIGGERED BY THE NOISE OF THE DOOR AND THE LITTLE DOG BARKING AND ALL !!! THE ADOPTED PIT FROM THE POUND WILL LICK YOU TO DEATH...SHE'S A GOOD PIT! Animal control is looking into a deadly dog attack. Sophie, a Cavalier King Charles Spaniel was attacked and killed by a PIT BULL yesterday. Both Sophie's owner and the owner of the Pit Bull are completely devastated. They are both trying to understand how it all happened. For any owner, their dog is their best friend. But, for Suan Bowers, Sophie was more than just a dog. Sophie was her pride and joy. This freak accident has completely turned her world upside down. The only memory Suan Bowers has of her precious dog Sophie is the leash that she is holding onto. "And the dog got over the top of her, bit her in the head, and wouldn't let her go," said Suan Bowers. Bowers was visiting her friend when it all happened. It was when she came outside the door with Sophie on the leash, when she saw the Pit Bull Jetta being walked down the sidewalk. Sophie barked and wagged her tail, and Jetta reacted, attacking Sophie. Bowers, who knew Jetta, says the dog's behavior was unusual. "She wasn't aggressive towards me or anybody," said Bowers. Bowers calls it a freak accident, something Jetta's owner Rickey Daehler agrees with. He wasn't the one walking Jetta at the time, it was his roommate. Daehler says he has an idea of what might have happened. "Just her any loud noises like that she gets skittish," said Rickey Daehler. "But them opening the door, the dog just barking at her, it scared her." Daehler says he got Jetta from the pound and something must have happened to her before. "But she's a good dog," said Daehler. "She don't bother nobody, she'll lick you to death, I've had other animals back here and she gets along fine with them. It's just a freak accident, a horrible tragedy." "I can't blame anyone, it's something that's happened," said Bowers. "But it needs to be held responsible. It could be a kid next time." Animal control says the Pit Bull is being quarantined in the back yard. They say since the dog is up to date on its shots and the owners are good pet owners, the dog will only be quarantined for 10 days instead of the usual 45 days. The owners of the Pit Bull were issued a citation, and they are expected to plead guilty in court and pay the fine. She's a good dog? I beg to differ. Fining the pit bull owners a few dollars does not change anything. This is an ineffective law, and that is an understatement. The pit bull needs to be euthanized, the pit bull owners fined a considerable amount. How long will it be before this pit bull kills again? Any animal that is that easily triggered has no place in our communities. It has proven itself deadly and unpredictable. It should be euthanized. If pit bull owner had their way we would all be walking around with our heads down (don't look at the dog, he'll take it as a threat), slowly shuffling our feet (if you move too fast, you might startle it), without any pets of our own (it barked, growled, looked like a rat, stared, etc. and provoked it), and in utter silence (and don't cough either, that might cause an attack) all because their precious pittie is so super sensitive (read: ragingly unstable) that it might get spooked and kill you, your kid or your pet. Really? I don't think so. Time we fight back!